Luminescence has been recognised by the national Education Resources Awards (ERAs) in its Marketing Campaign of the Year category. The agency was commended as a finalist at the ERA’s lavish awards ceremony at the National Conference Centre, Birmingham, on Friday 16 March 2018. The Luminescence team was applauded for its integrated marketing campaign for The Møller Institute, which launched its new senior leadership programme, The Explorer Mindset, in Spring 2017. View the full list of Education Resource Awards 2018 finalists, here. Last year, this ERA category was won by the Royal Horticultural Society. The Marketing Campaign of the Year is awarded to “a company that can demonstrate the proven effect and the commercial success of a marketing campaign in the education services sector,” says the ERA. Judges looked for campaigns that integrated a combination of media, technologies and platforms to deliver relevant messages to the target audience(s). The ERA said the judges were not just looking for creativity, but for effectiveness as measured against original targets. Luminescence responded to the Møller Institute’s brief to develop an engaging brand concept for the executive education programme that made it ‘stand out from its peers’, and develop an integrated marketing campaign to attract 200 international C-suite level participants. 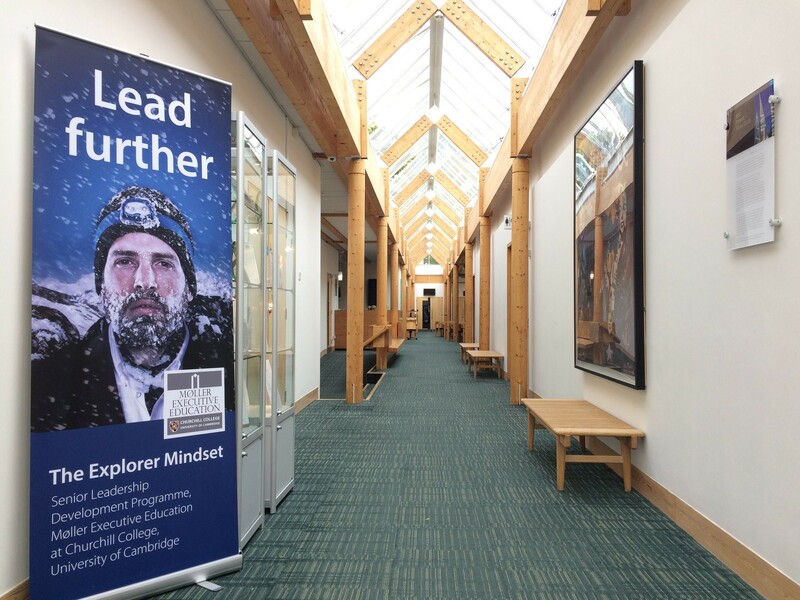 Luminescence developed the explorer metaphor for the creative brand of the programme, introducing a diverse trio of leadership ‘heroes’; a mountaineer, deep-sea diver and astronaut who lead “further”, “deeper” and “higher” in uncharted territory. The creative approach was a drastic departure from established executive education marketing ‘norms’. View the launch story of The Explorer Mindset, here. “The team from Luminescence have firmly embedded themselves into the Møller team and culture, and have inspired us to confidently differentiate this leadership programme from that of our competitors. The marketing campaign was created around the PESO model of Paid, Earned, Shared and Owned media channels, with a highly targeted communications strategy for the very specific programme audience. Campaign activity was plotted against a sales funnel to drive action from Awareness to Interest to Decision-making and Action-taking. Among the campaign is an unusual first-person point-of-view promotional video, a style that breaks the traditional mould for executive education programmes and displays historic Cambridge in a new, modern light. “We are absolutely thrilled to have been recognised for our strategic, creative and well-executed approach to marketing a campaign in the executive education sector. “This was a fast-paced campaign spanning a variety of media and involved a high degree of collaboration with Møller Institute. The process itself was as enjoyable as it was demanding, and the result was a hugely successful campaign. The Møller Institute is part of Churchill College at the University of Cambridge. It has been designing and delivering highly successful leadership development programmes for global organisations for more than a decade, and is itself multi-award winning, including as the UK’s Best Management Training Centre. The Møller Centre was founded as a Centre of Excellence, inspired by two great leaders: Sir Winston Churchill and Maersk Mc-Kinney Møller.